"I'll try to give you something a little bit more than I said before: we're focused on the characters we announced today." Marvel's Peter Phillips, the company's head of digital entertainment, is humoring me. I'm asking the questions Marvel fans want to know the answers to after Disney's unveiling yesterday of Disney Infinity Marvel Superheroes, and we both know he's not free to answer them. I try every strategy I know: hypotheticals, generalities, roundabout re-phrasings—"Are there licensing issues like in the film world or could the X-Men potentially appear?" "Is there a sense that characters like Deadpool and The Punisher can't be included because it's a family game?" etc. Phillips isn't budging, but he seems to sympathize. "There's really no limit to the conversations we want to keep having," he says. "There's always more to come, and this game is very broad, for fans of all ages. So you can sort of broaden that to think there's no limit. We can do anything!" Disney Infinity sold gangbusters last year, moving 3 million starter packs and accruing an estimated $500 million in global sales, which Disney was all too happy to brag about before its big reveal yesterday at the storied Cinerama Dome theater in Hollywood. For a first-year franchise, Disney Interactive President James Pitaro pointed out during the company's presentation, that's pretty impressive. Naturally Disney went all out for this announcement, including trotting out Agents of S.H.I.E.L.D. star Clark Gregg to introduce "Agent Pitaro" and, later, to share banter with Marvel Chief Creative Officer Joe Quesada. Gregg good-naturedly complained of his character Agent Coulson's absence from Thor: The Dark World and Captain America: The Winter Soldier, but confessed, "The one thing I'm not in that I would like to be in is Dancing With the Stars." Quesada replied that the ABC reality show has already been infiltrated by agents of Hydra. It was funny, but it made me think about how Disney Infinity itself is about to be invaded by Marvel die-hards. 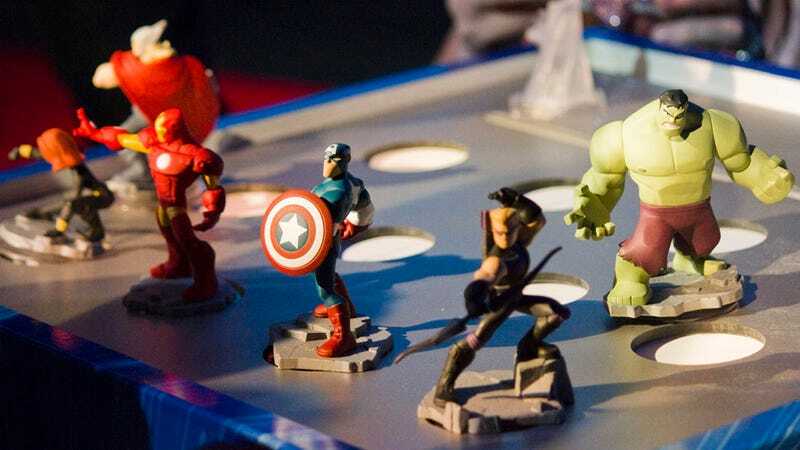 Disney is no stranger to dealing with the fervor of dedicated Marvel fans, and Disney Infinity already has its own worshippers. But in addition to the six Avengers—The Hulk, Captain American, Thor, Black Widow, Hawkeye, and Iron Man—revealed yesterday, there are at least a dozen more Marvel characters coming. And people desperately want to hear that their favorites are being included. Samuel L. Jackson's Nick Fury and Guardians of the Galaxy's Rocket Raccoon and Groot made appearances in game footage and trailers, among many others, including Marvel villains Loki and MODOK. Even Spider-Man appeared briefly. Disney Infinity is not a film, so the licensing troubles that have kept Spidey, the X-Men and others from appearing in Marvel's well-received silver screen soirees don't apply. Peter Parker's presence in Infinity 2.0 proves that; so might Wolverine, Magneto and co. appear too? Phillips and Avalanche Software Vice President and General Manager John Blackburn dodged the question, so naturally I asked about Star Wars next. Will next year's inevitable Disney Infinity 3 sport a subtitle like "Jedi Knights" or "Heroes of the Force"? To borrow a notion from Kotaku commenter WFROSE , is there a game in the works at Avalanche Software in which Nick Fury could fight side-by-side with Mace Windu in a strange meta-convergence of Sam Jacksons? Is there a game in the works at Avalanche Software in which Nick Fury could fight side-by-side with Mace Windu in a strange meta-convergence of Sam Jacksons? "We got the question a few times today," Blackburn said, finally opening up a bit. "Last year at this time, when we were [announcing Disney Infinity], the question was, 'Hey when's Marvel going to be in here?' Right? You know, I think it's this whole thing of last year we were working on this and I couldn't tell anybody about it. I was dying to be like, 'Oh god!' I'd love for everybody to know, right? But I think at the end of the day we're here to focus on [Marvel]. This is a big deal for us." But the Windu-Fury showdown "would be awesome," he admitted, laughing. Marvel was the focus, yes, but Blackburn and his Avalanche cohort John Vignocchi spent some time on stage talking about Infinity 2.0's new features as well. Chief among them are new gameplay scenarios that embrace elements from genres like tower defense and dungeon-crawling, with more to come. I asked Blackburn and Phillips if they consider Disney Infinity to be "every game in one," or in other words, the only game a family needs; will it ultimately embody every genre and play style? Blackburn, who oversees development of Infinity, said they see it simply as a platform that's always growing and will ultimately have something for everyone. "I think about it more from the point of view of this is a platform, and it is going to be an expanding platform for us," he said. "If we're covering a lot of different content that the company has to offer, there's always something that is hopefully going to be interesting to somebody." And if it replaces ten other games in the process, all the better, obviously. In addition Infinity 2.0 includes more robust creation tools, with detailed interiors and new mission-building features, and new additions like procedurally generative "brushes" and charming little automated "builders" make it easy for kids to be proud of their creations. On stage during the event Blackburn told a story about his five-year-old nephew, who preened over an adorable but pitifully sparse level he'd created. "That was a great moment," Blackburn said. But his nephew and other kids will find the creation tools in 2.0 much more enabling. Still, the new characters were front and foremost. They all have special movement systems unique to their powers, including flight, super jumps and "wall-crawling." They have special combat skills as well, and players will customize them through brand new skill trees. "We're a brand that has over 8,000 characters, so there's no shortage of ideas." In addition this sequel won't only feature Marvel characters; it wasn't exactly clear during the presentation, but Blackburn and Phillips confirmed that more general Disney-themed characters will be announced as well, likely during or after E3 in June. "We're a brand that has over 8,000 characters, so there's no shortage of ideas," Phillips said. They also confirmed that everything will carry over from the first game, and Blackburn explained that there will be new reasons to pick up old characters again—they get access to the skill and stat trees new to Disney Infinity 2.0, albeit in truncated form. So where does it end? Some players have wondered why Marvel is holding back; why not please everyone by including every niche character imaginable? Sticking to well-loved characters ensures the most resonance with Marvel and Disney's massive fanbases. And with the retail limitations inherent to the game's reliance on physical figurines, they can't exactly churn out hundreds of characters overnight if they want them to fly off shelves. That also helps explain why more game makers aren't getting into the genre dominated (and solely inhabited by) Infinity and Activision's Skylanders. "Having walked the walk for the past couple years—it's hard!" Blackburn said, laughing. Phillips added, "This is not a slam dunk. It's hard to do it and do it well." Arguably the other biggest news, though not exactly unexpected, was that Disney Infinity 2.0 will be available on Xbox One and PS4 as well as Xbox 360, PS3, Wii U, iOS, and PC. The current-gen versions will have superior graphics, of course, but Blackburn confirmed that the Xbox One and PS4's more powerful hardware will also enable those versions of the game to support more complex Toy Boxes than their last-gen counterparts. That means more toys, of course, and likely other enhancements, though the exact details aren't nailed down yet, Blackburn shared. There are plenty of questions left to ask about Disney Infinity Marvel Superheroes. Sam Jackson appeared on video as S.H.I.E.L.D. Director Nick Fury at the beginning and end of the event to discuss the importance of "Project Infinity," but his closing remarks were cut off—just as he was about to reveal more of the incoming Marvel characters—with some static and a message about E3. Until then all we can do is speculate, so have at it: what Marvel heroes and villains do you want to see in Infinity 2.0? Considering Black Widow is the only female character in the spotlight so far, I'd love to see Gamora, which seems likely, given the probability of prominent Guardians tie-in content. What about you?